July 1982 – Internews is founded in San Francisco and our first project, funded by the Kenall Foundation, is to compile archives of films, TV shows, and documentaries about nuclear war. September 12, 1982 – Internews creates the first “Spacebridge,” a two-way satellite link-up between Soviet youth in Moscow and Americans. Our production era culminates with "Capital to Capital," linking the US Congress via satellite with Deputies in the Supreme Soviet, on ABC news and throughout the Soviet Union. The series earns Internews an Emmy Award. "We had a non-partisan philosophy. As we tried to bridge the East-West divide we also sought to overcome political ideology itself. Television offered us the perfect means for doing that, because we could take traditional enemies and put them in the same electronic space." April 15, 1990 – Internews shifts its focus from producing international television programs to supporting the nascent non-governmental media in Eastern Europe and the former Soviet Union. 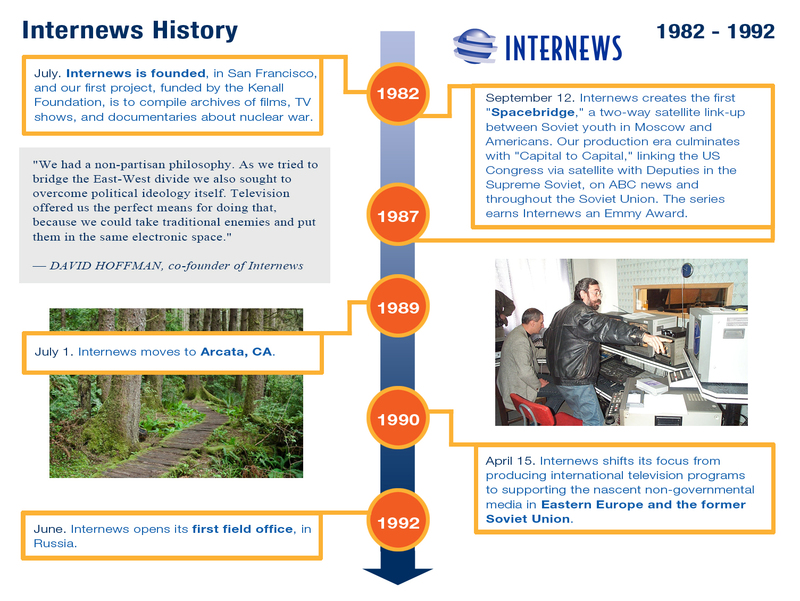 June 1992 – Internews opens first field office, in Russia. November 1, 1993 – Internews and the Jerusalem Film Institute launch a project to develop Palestinian television, including training in news production and election coverage and a conference on Palestinian broadcasting. November 3, 1994 – With Sarajevo under siege by the Yugoslav National Army, Internews runs the Balkan Media Network, an early version of an electronic bulletin board and email system that connects 250 independent media organizations as well as ordinary citizens in the former Yugoslavia with the rest of the world. 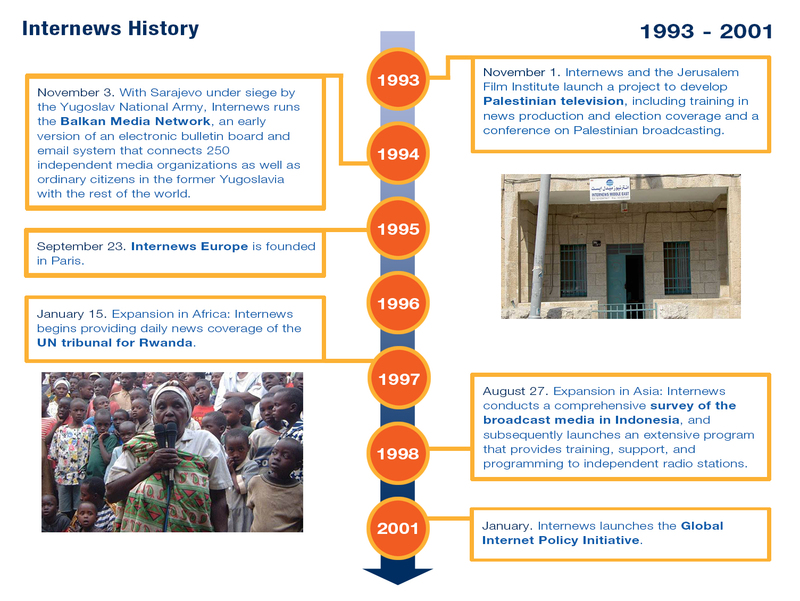 September 23, 1995 – Internews Europe is founded in Paris. January 15, 1997 – Expansion in Africa: Internews begins providing daily news coverage of the UN Tribunal for Rwanda. August 27, 1998 – Expansion in Asia: Internews conducts a comprehensive survey of the broadcast media in Indonesia, and subsequently launches an extensive program that provides training, support, and programming to independent radio stations. January 2001 – Internews launches the Global Internet Policy Initiative. February 1, 2002 – The Post-9/11 Era: Internews establishes an office in Kabul, Afghanistan to help establish local, professional media. June 1, 2002 – Expansion in Thematic Journalism: Local Voices launches, to increase accurate and effective coverage of HIV/AIDS, with offices in Kenya and Nigeria. The project later expands to Ethiopia, Cote d'Ivoire, and India. 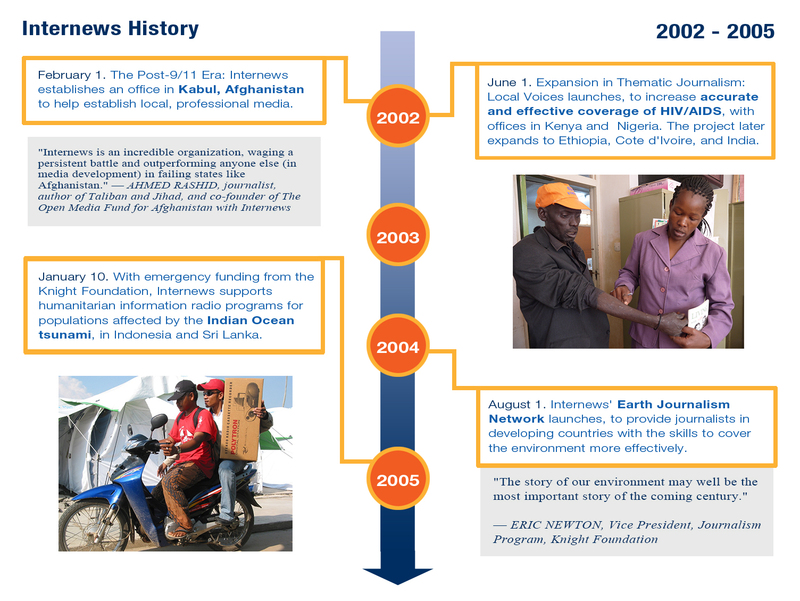 August 1, 2004 – Internews' Earth Journalism Network launches, to provide journalists in developing countries with the skills to cover the environment more effectively. January 10, 2005 – With emergency funding from the Knight Foundation, Internews supports humanitarian information radio programs for populations affected by the Indian Ocean tsunami, in Indonesia and Sri Lanka. "The story of our environment may well be the most important story of the coming century." October 1, 2005 – The Global Forum for Media Development, organized by Internews and 17 other organizations, meets in Amman, Jordan, uniting hundreds of media support NGOs, journalists, broadcasters and activists from 97 countries. December 2008 – On the 60th anniversary of the Universal Declaration of Human Rights, Internews and the Every Human Has Rights campaign, supported by The Elders, host the Every Human Has Rights Media Awards in Paris. January 13, 2010 – Emergency media and information programs prove ever more needed and effective, as Internews responds to the Haiti earthquake with daily humanitarian programming. 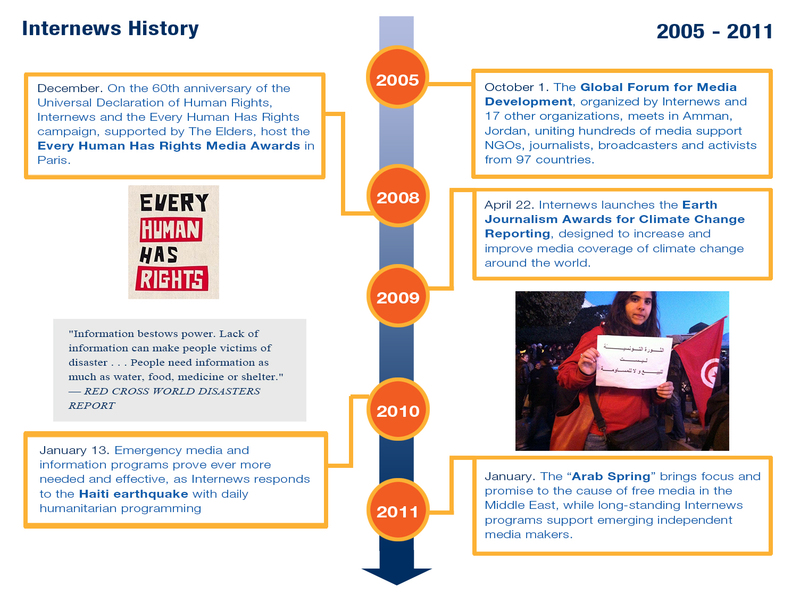 January 2011 – The ‘Arab Spring’ brings focus and promise to the cause of free media in the Middle East, while long-standing Internews programs support emerging independent media makers. January 1, 2012 – Internews celebrates 30 years, and launches its new logo and tagline: Local Voices, Global Change. February 2012 – Internews further expands work in response to the ‘Arab Spring’ with a program to support new, independent media in Libya. January 1, 2013 – As Internet Freedom and Digital Security take on increased importance worldwide, Internews focuses and expands its work through the new ICT Policy and Programs department. April 2013 – Internews relocates its European headquarters from Paris to London. August 2013 – Increasing recognition of the role of media and information in emergencies as Internews joins the UK government’s Rapid Response Facility. 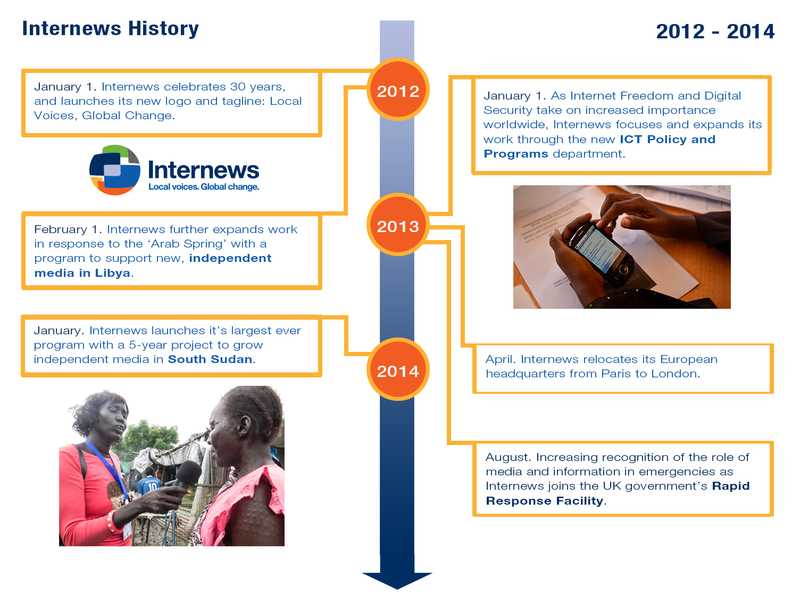 January 2014 – Internews launches it’s largest ever program with a 5-year project to grow independent media in South Sudan. February 2014 – Internews’ emergency response to Typhoon Haiyan in the Philippines is singled out by the UK Independent Commission for Aid Impact "for highly cost effective, disproportionately positive impacts." 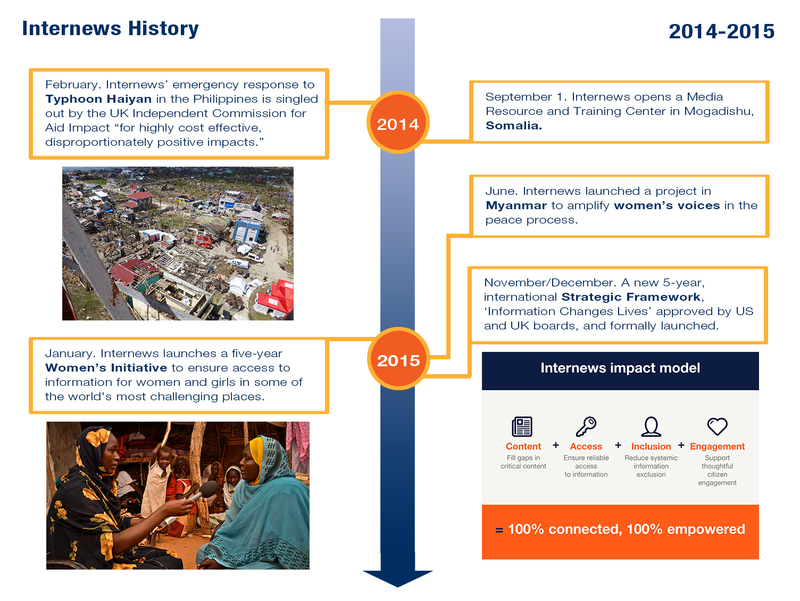 January 2015 – Internews launches a five-year Women’s Initiative to ensure access to information for women and girls in some of the world's most challenging places. November/December 2015 – A new 5-year, international Strategic Framework, ‘Information Changes Lives’ approved by US and UK boards, and formally launched. October 2016 – Internews mounts another emergency response in Haiti, this time in response to Hurricane Matthew. March 2017 – "News That Moves," a project to provide vital information to refugees in Mediterranean countries, secures a finalist position at the Bond International Development Awards. September 2017 – Internews expands its US programs beyond New Orleans with the establishment of the Learning Post Collective. November 2017 – The Global Media Solutions Coalition, led by Internews in collaboration with the World Economic Forum, is established to help transform local media markets around the world, so that citizens, businesses and governments everywhere can benefit from the positive impact of high-quality, local news and information. 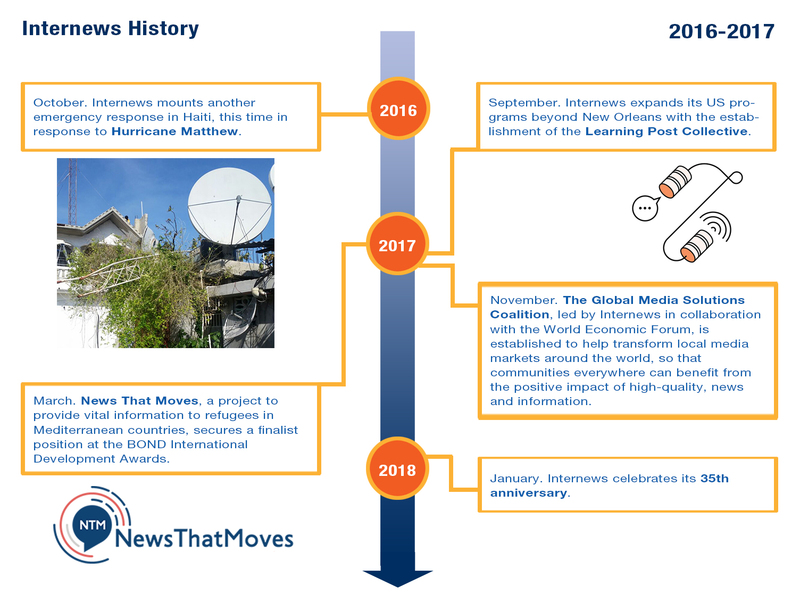 January 2018 – Internews celebrates its 35th anniversary.